JAEGER LECOULTRE REF. 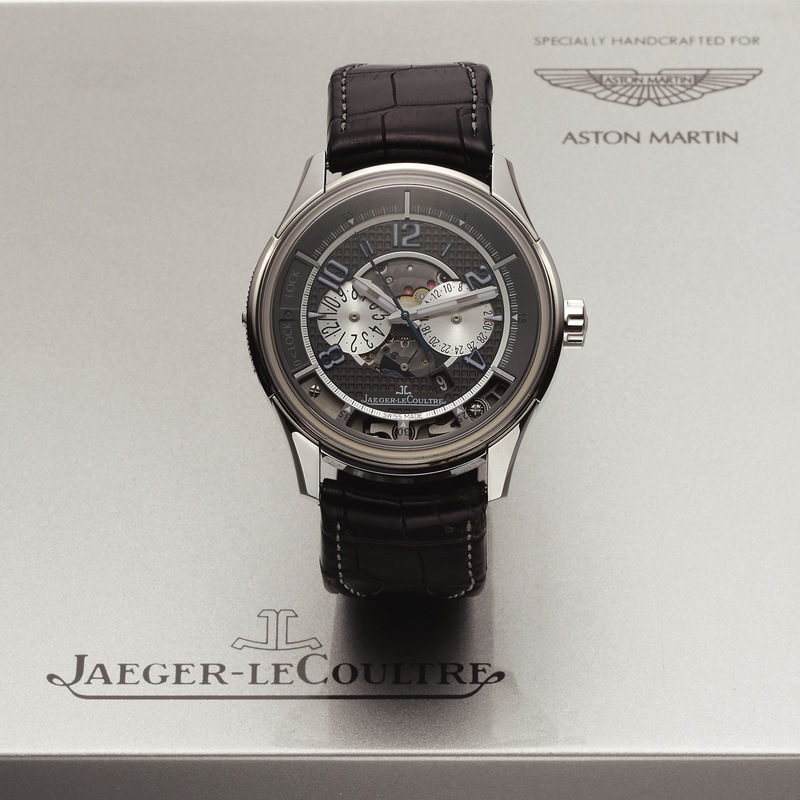 192.6.25 ASTON MARTIN CHRONOGRAPH LIMITED EDITION PLATINUM Jaeger-LeCoultre, Aston Martin, Master Control 1000 Hours," No. 095 / 100, Ref. 192.6.25. Made in a limited edition of 100 pieces in platinum for Aston Martin in 2008. Very fine and rare, large, self-winding, water-resistant, platinum wristwatch with pivoting-case chronograph, registers, date and an 18K white gold double deployant clasp. Accompanied by the original fitted box, Certificate of Origin, and instruction booklet. Three-body, polished, concave lugs, inner pivoted case activating and stopping the chronograph by depressing the crystal at the top, return-to-zero function by depressing the crystal at the bottom, locking slide in the band, case back with 8 screws and Aston Martin logo, sapphire crystal. Textured two-tone gray and silver with applied luminous Arabic numerals and baton indexers, outer 1/5th seconds track, partially skeletonized at 3 and 9 for the 30-minute and 12-hour registers, small second hand and rotating disk with Aston Martin logo at 6, aperture for the date at 5. Luminous steel hour and minute hands, red chronograph hand. Cal. 751B, rhodium-plated, fausses cotes decoration, 39 jewels, straight-line lever escapement, monometallic balance, shock absorber, self-compensating fl at balance spring. C. Three-body, polished, concave lugs, inner pivoted case activating and stopping the chronograph by depressing the crystal at the top, return-to-zero function by depressing the crystal at the bottom, locking slide in the band, case back with 8 screws and Aston Martin logo, sapphire crystal. D. Textured two-tone gray and silver with applied luminous Arabic numerals and baton indexers, outer 1/5th seconds track, partially skeletonized at 3 and 9 for the 30-minute and 12-hour registers, small second hand and rotating disk with Aston Martin logo at 6, aperture for the date at 5. Luminous steel hour and minute hands, red chronograph hand. M. Cal. 751B, rhodium-plated, fausses cotes decoration, 39 jewels, straight-line lever escapement, monometallic balance, shock absorber, self-compensating fl at balance spring. Dial, case and movement signed. DIAM. 44 mm. THICKNESS 14 mm.